On arrival at NJP railway station or Bagdogra airport meet with our representative and leave for Dooars. On arrival, check into the tea bungalow. Evening is free for leisure. An overnight stay at tea bungalow. Enjoy the lunch at tea estate with lots of folk stories. The oldest part of the tea garden is date back to 1927 and prior to 1963. It was owned by British. Later, return back to the bungalow. In the evening, one can enjoy golfing at its golf course. An overnight stay at the bungalow. After breakfast, we will visit the Damdim tea estate. Previously, it was known as the Barrons Tea Estate. 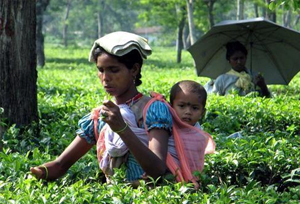 Damdim tea estate deriving its name from ‘DemaDema’ was come from the Bhutanese and Tibetan languages. The tea estate is located within the foothills of eastern Himalaya and the region name is thought to derive from the word “dwar” meaning “gateway” as the area was densely forested being part of the flood plains of the mountain rivers and allowed 18 different entry points into Bhutan. 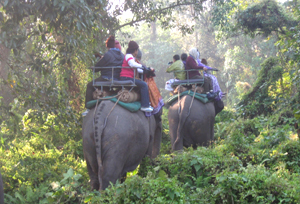 Today, we will drive to Jaldapara National Park, situated within the foothills of Himalayas. It was declared as a wildlife sanctuary in 1991, for the protection of the one-horned rhino. The park is flung by river Torsa and river Malangi. 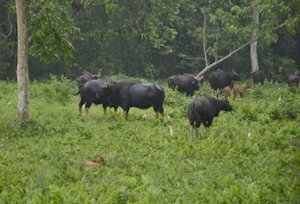 The sanctuary is mostly covered with tall grasses and comprises rich vegetation and a variety of wildlife. On arrival in Jaldapara, check into the wildlife resort. After fresh-n-up, we will explore the nearby tribal villages within the vicinity of the national park and will also enjoy a nature trail. Later, return to the resort for an overnight stay. This morning we will awake a little early and will move to Elephant riding point to enjoy a thrilling elephant safari in Jaldapara National Park for wildlife viewing. Later, return to the resort for breakfast. After breakfast, enjoy the atmosphere and the glimpse of nature around the wildlife resort. After lunch, we will again visit to the National Park. This time we will enjoy our jeep safari to the national park to explore its exquisite beauty of the vast grassland. The National park is well famous for the Indian one one-horned rhinoceros and holds the highest rhino population in India after Kaziranga National Park. The other fauna found in Jaldapara are tigers, elephants, deers, sambar, wild pig and bison and a number of avifauna are also found in Jaldapara which make it a paradise for bird watchers, the avifauna are the Bengal Florican, crested eagle, Pallas's fishing eagle, jungle fowl, peafowl, partridges, and lesser pied hornbill, etc. In the morning after breakfast we leave for Bagdogra / NJP to connect with onward destination.